Togo, officially the Togolese Republic (French: République Togolaise), is a country in West Africa bordered by Ghana to the west, Benin to the east and Burkina Faso to the north. 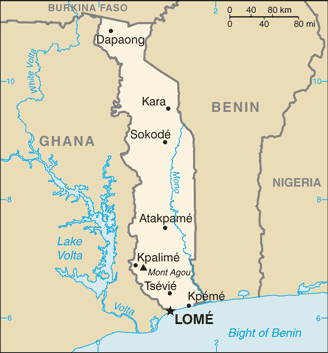 It extends south to the Gulf of Guinea, where its capital Lomé is located. Togo covers an area of approximately 57,000 square kilometres (22,000 sq mi) with a population of approximately 6.7 million.